Tyrokafteri, pronounced tee-rho-ka-fte-RHEE, from the Greek words “tyros” = cheese + “kaftero” = hot, in some places also called “ktypiti” or “kopanisti”, is a dip or a spread with cheese and red hot peppers. “Kopanisti”, takes its name from the cheese produced in the Cyclades and the Aegean, which is a type of soft cheese with a peppery, spicy flavor. However, it can also be made with any kind of feta or other soft cheese. 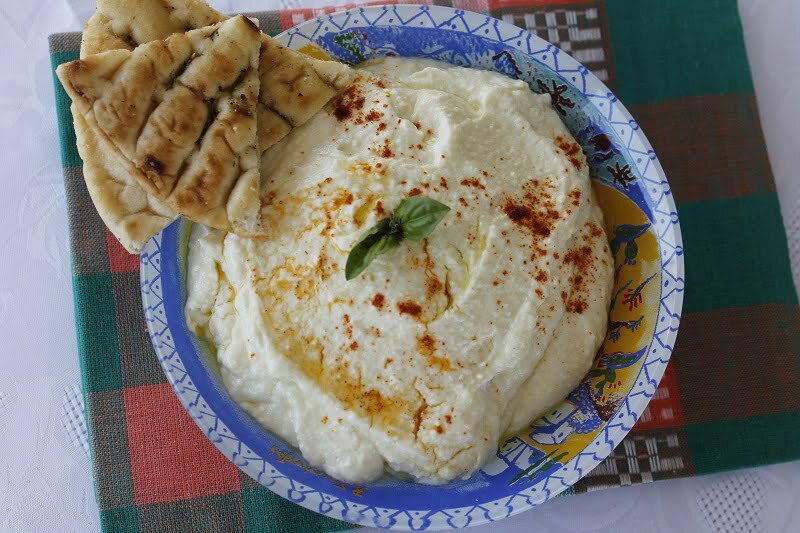 This dip or a spread is made with a soft, creamy cheese with a peppery, spicy flavor which is called kopanisti and is produced in Mykonos and in other Cycladic islands. The other ingredient which makes it hot is the roasted hot peppers added to the spread. It is more usual to find it under the name tyrokafteri in most Greek tavernas and is ideal to go with wine, ouzo or raki. In the post you will find two recipes. One was made one day when I could not find any hot peppers, so I used sweet peppers and harissa and the second one at the end, is the traditional recipe, made with hot peppers. As I have mentioned in a previous post, when I wrote about Kokoras Krassatos, our friends from Crete sent us a lot of xynomyzithra. They live in a village in Crete and have their own sheep as well as other other livestock and they make the cheese themselves. They sent me too much, four large blocks, each one must be more than one kilo. Last year when they sent me some again, I stored it in the deep freezer and we were eating some for the past year. Last week I thawed a big piece and made a tyropita with puff pastry but I still had some left, so I decided to make some tyrokafteri. My husband went to buy the groceries but unfortunately he did not find hot bulls’ peppers, so instead he brought two red and two green sweet peppers. However, I had this crave for tyrokafteri that I decided to make some any way, even if I didn’t have the hot peppers. Recently, when I visited the central market of Athens, Varvakeios, I bought some harissa so I decided to give it the hot touch with this Tunisian hot pepper. I roasted the peppers and put them in a food processor with some feta, xynomyzithra, yoghurt, olive oil and harissa and puréed them for a few minutes until they became a nice, hot spread. The spread was perfect, hot but so addictive we could not stop eating it. The leftover was even better the following day as a spread on some crackers. Start by roasting the peppers. See how to roast them here. Brush the peppers with olive oil and bake in a preheated oven to 200 degrees Centigrade, for about 10 – 15 minutes, turning them over once, and bake them for another five minutes, taking care not to burn them. 3. Put all the ingredients in a food processor and mix until you have a creamy consistency. 4. Transfer to a bowl, refrigerate and serve with some pita chips! Note: I preferred not to add vinegar or lemon juice, as xynomyzithra has a slight sour taste. Xynomyzithra may be substituted by anthotyro (similar to ricotta) or you can make the spread using only feta. If you use green hot bull’s horn peppers substitute the red and green pepper with 2 roasted hot peppers. In this case harissa would not be necessary. See recipe which follows. I am submitting this recipe to Rachel, at The Crispy Cook, who is hosting this weeks’ Grow Your Own, created by Andrea, of Andrea’s Recipes. This is the traditional recipe of tyrokafteri, made with the long, hot green peppers, which is a cheese dip, which is perfect as an appetizer on bread, pita chips or crackers. Usually, hot peppers are sold in Greece in a bunch of 8 – 10 peppers. They are too many to use to make tyrokafteri. What I do, is roast all of them and then after peeling and deseeding them, I put them in pairs in plastic bags and store them in the freezer. Whenever I need to use them, I just thaw two, which isn’t even necessary as they will mash easily in the food processor and make the dip! Tyrokafteri, which is a Greek cheese dip, is made with roasted hot green peppers and feta. It is perfect as an appetizer on bread, pita chips or crackers. Begin by roasting the peppers. Wash the peppers and after draining excess water brush them with the olive oil and place them in the oven until their skin blisters. Watch them carefully so they do not burn. Place the roasted peppers in a plastic bag and seal for 5 – 10 minutes and allow them to sweat. When you can handle them, remove the stems and discard the skin, seeds and any veins. Put them in a food processor and mix, adding the remaining olive oil and vinegar. Finally add the cheese and mix to make a creamy spread. Depending on the colour of the peppers used, the dip will take the colour of the peppers. If you use only red peppers the dip will be red-ish, if you use dark green, the dip will be green-ish and if you use light green, they will have a lighter green-ish colour. This sounds absolutely delicious. Cheese, in any form, makes my knees weak! Thanks for sharing this and submitting to Grow Your Own. Now I have to get thinking and cooking for your guest hosting of Weekend Herb Blogging…. A delightful speciality! I’m a cheese addict, so your recipe makes me drool… Yummy! When I carave something, I have to make it too! Great version Ivy! Wow, that really does sound like an incredibly flavorful dip–and home-made cheese? I’m so jealous! I’d probably be finding excuses to serve this on everything until I ran out. Oh my, that looks like my kind of spread. Wish I could find some of that kind of cheese around here, but it might be hard! I like savoury food and this sounds nice. It looks like the perfect spicy spread. While I don’t get goat cheese, I could probably use soft cheese we call paneer. In Thessaloniki, we call it Xtipiti and regardless of the regional names, this is one of favourite dips…nice use of Harissa. This looks very tasty Ivy. Oh, cheesy, cheesy goodness is what this is! I just love learning new dishes to add to the holiday table, and this greek one is certainly one of them! Pretty soon, thank to you, I’ll be the Asian making great Greek food! I love learning about all of these cheeses from you, Ivy. Ivy, This dip looks amazing. I love the blend of cheeses. The touch of lemon juice sounds nice as well. Oh, Ivy, that cheese is making my mouth water… straight from the producer’s hand… I love it! Nice recipe! There is a restaurant in Greektown that used to have this as part of a trio of dips appetizer. I loved it sooo much, but I guess I was the only one who could handle the heat b/c they took it off the menu and replaced it with a more mild dip. I was so sad and was never able to find a recipe that could re-create it… I’m excited to try this and see what happens!